The popular programme of Thursday evening meetings restarts on 29th September at our new regular venue of Buckfastleigh Town Hall. Parking is easy, in the nearby Victoria Woodholme and Mardle Way car parks, and both are free after 6.00pm. 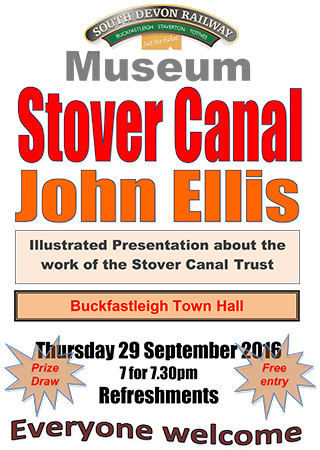 The September meeting features a visit by John Ellis, of the Stover Canal Trust, who will give an illustrated presentation about the history of the canal, and the work going on at present to renovate it. Another evening full of interest about a very significant local piece of industrial archaeology. As usual, doors open at 7.00pm, and the meeting starts at 7.30pm. Do try to come along.